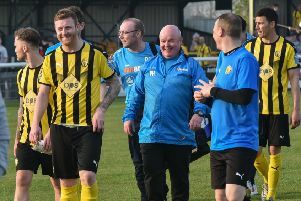 The curse of the manager of the month award struck on Saturday as Leamington’s eight-game unbeaten streak was ended by the Pilgrims, writes Paul Okey. Eight points from a tricky run of fixtures in October had lifted Brakes clear of the relegation zone and earned Paul Holleran the National League North Manager of the Month Award. Conversely, Boston arrived at the Phillips 66 desperate for a result after a pointless October had left them languishing in the bottom three and without a manager following the resignation of Adam Murray. However, it was the visitors who made the most positive start, taking the lead in the third minute after Tony Breeden had failed to deal with Sam Muggleton’s exocet-like throw from the left touchline, Brad McGowan converting at the far post. Another long throw, this time from James Clifton, caused more chaos in the home box but Jay Rollins saw his shot blocked. Brakes were looking a shadow of the side which had taken four points from Salford and Harrogate Town and had to wait until the 22nd minute for their first shot, Rob Thompson-Brown firing straight at George Willis from the edge of the box. Jack Edwards was afforded a free header from a Kieran Dunbar corner but he was unable to keep his effort down before the home side had strong claims for a penalty after Junior English went down in the box. Referee Thomas Kirk was unmoved, however. Strong hold-up skills from English presented Callum Gittings with a shooting chance but his sidefoot effort was always rising too high. The sense of injustice Brakes felt at the denial of their spot-kick manifested itself in crude challenges from English and Gittings which earned both the perpetrators yellow cards. And, with the red mist descending, Leamington were further embittered when Kirk had no hesitation in pointing to the spot after Harry Vince was sent tumbling under pressure from James Mace after Boston had carved open the home backline. Breeden guessed the right way for Ashley Hemmings’ penalty but the strike was far too good for the home skipper, shaving the inside of the post. Another Edwards header failed to find the target before the visitors spurned a great chance to make it 3-0 in first-half injury time, Clifton unselfishly laying the ball off to Vince after a mazy run through the Brakes defence, with the teenager ballooning his effort over the crossbar. Leamington were much-improved after the restart and were almost handed a way back in the 47th minute when Willis picked up a backpass on the corner of his six-yard box. However, Gudger drilled the ball into the side netting after Dunbar had touched the free-kick to him. Thompson-Brown took advantage of a misunderstanding on the half-way line to nick possession off the visitors, allowing Revan to race towards goal but Willis was out bravely to block with his body. Liam Canavan glanced Gudger’s free-kick narrowly past the far post before Dunbar half-volleyed just wide as Brakes ratcheted up the pressure. The hosts were denied a lifeline in the 56th minute when Revan appeared to be dragged down by McGowan in the box. However, referee Kirk again waved play on to the fury of the home bench, who were now sensing it was not going to be their afternoon. More Revan trickery again ended in a tumble in the area under pressure from McGowan but he quickly regained his footing and worked the ball to Dunbar whose shot was well parried by Willis. Dunbar drew another smart save from Willis after a corner had been returned to him, driving into the area before unleashing a powerful drive which the visiting custodian got strong hands to. New signing Kaine Felix was introduced against his former side with almost 25 minutes to go but found opportunities to use his searing pace limited as Boston gained a foothold in the second half for the first time. Hemmings held the ball up well before teeing up Clifton who blazed over, while good pressing from Leamington set up a promising break which was let down by Revan’s final ball to Dunbar. Gregg Smith outmuscled English before drawing a smart parry from Breeden and the home defender was then in the action at the other end, firing narrowly wide with a spectacular volley. Good persistence from Revan then allowed him to shrug off a couple of challenges and get a shot away which was tipped over by Willis. Felix was denied a debut strike by the feet of Willis after Canavan’s flick-on had released him on the angle, while substitute Joe Clarke was unable to produce a finish to match his neat chest control, skewing his volley well wide of the target. Boston were then denied a chance to make the scoreline even less reflective of the game in injury time, Jamie Hood producing a last-ditch challenge to deny Jack Broadhead after a swift counter-attack from the visitors. Nevertheless, October now seems a long time ago. Brakes: Tony Breeden, James Mace, Connor Gudger, Callum Gittings (Colby Bishop, 83), Jamie Hood, Junior English, Kieran Dunbar, Jack Edwards (Joe Clarke, 78), Kurtis Revan, Liam Canavan, Rob Thompson-Brown (Kaine Felix, 67). Subs not used: Richard Taundry, Joe Magunda. Boston United: George Willis, James Clifton, Sam Muggleton, Jamie McGuire, Brad Beatson (Jan Yeomans, 63), Brad McGowan, Jay Rollins, Jordan Keane, Gregg Smith (Kabongo Tshimanga, 78), Ashley Hemmings, Harry Vince (Jack Broadhead, 83). Subs not used: Morgan Penfold, Liam Adams.